Stepped off the Plane at LAX with a Dream and a Cardigan! HOLA FAMILIA :) I don’t even know where to begin.. LA is fantastic! The weather is incredible and the work is busy! What more could I ask for? The first day was probably the longest by far! we landed in LAX all 20 of us. I was hoping to sit by a non-member on the plane, but turns out I needed some uplifting instead so I was next to a returned missionary. He shared with me is experiences in Nicaragua and gave me some advice. I stepped off the plane and as tired as I was (yes I only had 3 hours of sleep...) I was truly excited and anxious to know who my companion would be and what being out in the field would be like. I think the longest parts of this first week are all the trainings and meetings. They are important, but I really have a hard times sitting for that long! So I was assigned to work with Sister/Hermana Stevens!!! I absolutely love her! She is crazy, energetic, spunky, loving, and has such a strong testimony of the Gospel:) She loves the people so much! I am learning a ton from her! We have a blast and get along great! 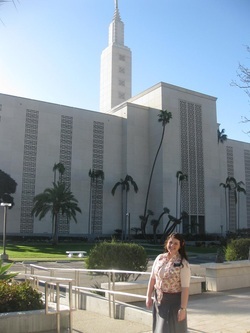 She really was an answer to many prayers :) Sister Allison Lee Stevens was called to serve in the Los Angeles California Mission and to the Temple Visitor Center. I believe that the Mission Presidents Wife sent home some pictures of our first transfer and companion?? If not the keep a mission Blog (which mom is in one of my letter the Mission President sent me which you should have) (Sadly they won’t let me look at the website you are making papi:( they don’t even let us look at the Mission Blog.... There also isn’t any time too. So when Mckay is on his mission you will have to forward me his emails... and Megs please :) _ Anyway We got right to work! We have one Investigator with a baptismal date- Richard! I love Rick:) He is married to Thelma who is a convert for several years. They are so warm and loving! I struggled to not call myself Brianna... Anyway its gone a lot better, but I always feel bad cause Richard always wants to hug us goodbye, but mission rules are mission rules) Hna Stevens and I teach really well together! I love teaching with her and I love seeing the progress Rick is making! His baptismal date is February 24th! yay my first baptism:) Last night Rick bore is testimony to us. I wasn’t able to see the miraculous change in him, but I felt of his strong testimony and love for our savior Jesus Christ. The Gospel really does change people lives! Living in Utah where most of our friends are members and the spirit is in people’s homes I never realized how strong the spirit is in people homes. There was such a huge contrast in the feeling of Rick’s home compared to Mary’s! I was shocked. I feel so close to the spirit and to my savior Jesus Christ here. Personal Study time is truly a treat! So every day we work Six hours in the Visitor Center(VC) every day our scheduled time is different. We wake up at 6:15 and go running in the large church parking lot. It is actually really fun to see all the Visitor Center (VC) sisters running together in the morning- I love it! we then get ready for the day have personal study time and companionship study time if we aren’t scheduled at nine in the VC. Sometimes we have to find time in the VC to do personal Study time. It is really crazy to balance the VC with our Area. We run from one thing to the next- There is never enough time! I drop into bed at 10:30 beat, but happy :) Even though I rarely have time to right in my journal I go to bed satisfied knowing that Hna. Stevens and I helped bring someone closer to Christ that day. Every night before we say our companionship nightly prayers we share one miracle we saw that day. There are miracles all around us every day! I want to encourage you to do the same- notice the miracles God gives you every day and they day always seems better and more optimistic. So I can definitely see how the VC could become a jail..... But I also see how the VC can be a healing ground. It all depends on me and my attitude and how I approach the day. I find it really exciting! We have the advantage of home base here!! I get to find new creative ways to listen, discern, help, and teach Gods children! I absolutely love teaching with the Christus and "Gods Plan For His Family" makes me cry every time. If you haven’t seen that movie at the VC I think you should go right now to Temple Square and ask the sister missionaries to show it to you! Two tender mercies I saw this week in the VC were of recent converts and members actually. One 20 year old recent convert brought in her nonmember parents. She was able to bare testimony to them of the Gospel and we were able to show them Gods Plan for His families. She teared up at the end of it. I don’t know if her parents fully understood her emotions... The Gospel adds a whole new meaning and purpose to the word Family. I am not sure even how to put it into words, but family is God’s gift to us- to bring us happiness. Thank you familia for shaping me into the person I am today- I Love each one of you and you mean so much to me. I am so grateful for the Plan of Salvation and the knowledge that we have that families can be together forever. Every family is different and unique and has its own problems. But I know God will tend the broken branches of family trees. The second was of an RM whose faith had been shaken. He had stopped praying and reading his scriptures... He is actually from UT- I don’t think it was by chance whatsoever that he happened to pass by the VC that day. He truly left having come closer to Christ that day with a new resolve to trust in Him and in his timing. Teaching him was an uplifting experience for all of us. That is the greatest thing about the Gospel! When we share it both ends are uplifted and brought closer to Christ. He taught me a powerful lesson of Agency as well. Sometimes bad things happen to people because of others Agency. I don’t believe God purposefully wants us to be hurt by someone or have an immense trial. Sometimes we do go through struggles, but we all have our Agency and ours should be that in adversity that we choose to turn to him rather then become bitter or turn away. My time is up, but know I love you all and that miracles happen every day! The Mission is such an incredible experience and I am so blessed to be serving My father in Heaven!